During hibernation when the conservation of energy is critical, certain parts of the immune system—at least in rodents where most studies have been done—are downregulated. The low body temperature and energy consumption protects hibernating mammals against many pathogens as they are adjusted to their hosts' regular body temperature. Because Pd grows at temperatures between 2 and 18 degrees C it overcomes this barrier. Based on the rodent studies, Ken Field, from Bucknell University in Lewisburg, USA, and colleagues hypothesized that hibernating bats may keep Pd in check by relying on non-specific (or innate) immune responses and memory immune responses. If those animals are immune naïve—that is, if they have not encountered and survived the Pd pathogen before—they have no immune memory to fight back strongly and might therefore succumb to the disease. 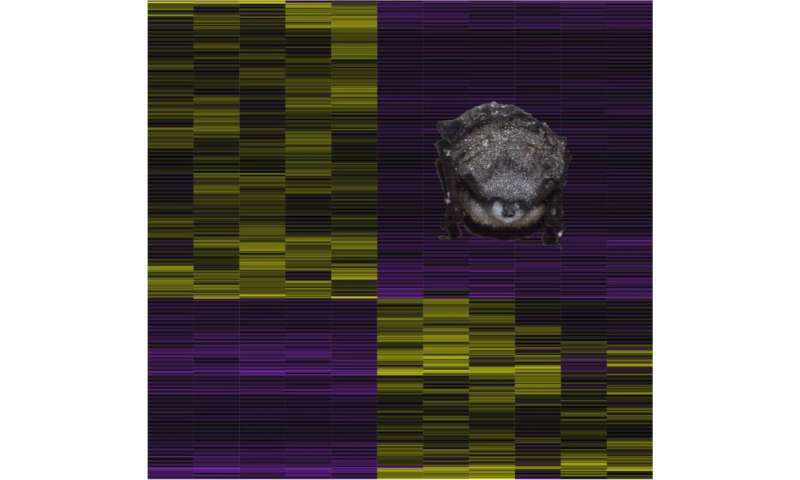 To study the actual host response, including the immune response, to Pd in hibernating bats, the researchers did a detailed analysis of all the genes active in the wing tissues of six hibernating little brown bats infected with Pd—including active genes of the fungus itself—and compared this to the gene expression pattern of non-infected little brown bats hibernating in captivity without Pd exposure.